The Free Women Forum is free and open to the public, with registration. There is a suggested donation of $10 per person to cover speaker costs, venue, and materials. All the sessions will take place in the Liberal Arts Building on the University of Texas, Austin campus. The address is 116 Inner Campus Drive, Austin, TX 78712. 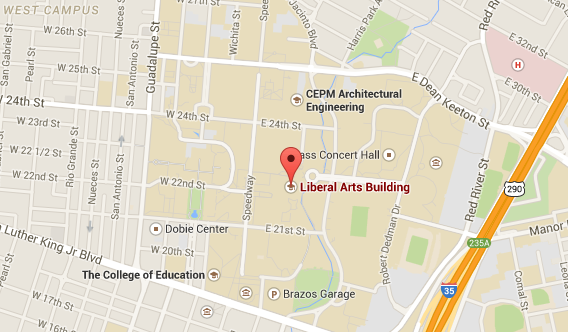 The Brazos Garage and Manor Garage are the closest to the Liberal Arts building. Each would then require an, approximately, ten minute walk to the venue. Within a ten minute walk from the Liberal Arts building there are dozens of fast, inexpensive restaurants. Most of these are located along Austin’s famous Guadalupe St. (pronounced Guada-loop, also called The Drag). Including: Chipotle, Jamba Juice, Potbelly’s, Pita Pit, QDoba, and Einstein Bros Bagels. The more adventurous may want to try one of the food trucks that congregate on W 23rd Street. Dress is casual. April weather in Austin ranges from sunny to stormy quickly. You will need to walk from campus to your chosen lunch location.